Dominion City Brewing is thanking the PC government for the opportunity to help newcomers. Ottawa's Dominion City Brewing is responding to the Ontario government's buck-a-beer challenge by donating money to help resettle Ottawa refugees. OTTAWA — An Ontario brewer is accepting Premier Doug Ford's buck-a-beer challenge, but on its own terms: by donating a dollar from each can sold to helping refugees. Dominion City Brewing announced on Wednesday that a dollar from each can sold of its upcoming Buck-A-Beer Blonde Ale will be given to a local agency to help resettle refugees in the National Capital region. "We just feel strongly that beer and a warm welcome belong together so the idea of supporting Refugee Welcome in Ottawa was an obvious one for us," brewery co-founder Josh McJannett told HuffPost Canada in an interview. He said the new policy opened a door for the brewery to give consumers a "social choice to support a cause we care about." BUCK-A-BEER: As an independently-owned brewery, we can tell you unequivocally that it is impossible to sell a beer for a dollar without compromising quality. So, we've decided to respond to Ontario's buck-a-beer challenge in our own way - by inviting our customers to help refugees build a new life in Ottawa. As our contribution, we're donating $1 for every can of our forthcoming Dominion City Buck-A-Beer Blonde Ale to support refugee integration efforts in Ottawa. Cans of BUCK-A-BEER will be available at the brewery and through Dominion City's online store Thursday August 30th at 11am. Cheers! McJannett said their upcoming blonde ale is the four-year-old brewery's way of saying "challenge made, challenge accepted, with tongue firmly in cheek" — a playful riff of the Progress Conservative government's "promise made, promise kept" slogan. "You know, we can't make a beer for a dollar that would be good or worth buying, but what we can do is help our customers to vote with their feet." Dominion City's announcement comes a day after Ontario's Progressive Conservative government revealed details of its plan to resurrect the province's buck-a-beer program. It also follows the province's recent clash with the federal government over who is responsible for paying refugee resettlement costs. Ford issued a challenge to Ontario brewers on Tuesday to lower their prices to $1 for any beer containing under 5.6 per cent alcohol volume as of Aug. 27. To incentivize brewers, the government is promising special LCBO promotional opportunities for those that deliver on this pricing. But McJannett said consumer habits have changed since buck-a-beers were last sold in stores a decade ago. People are more willing to make a social choice and pay a premium for quality local ingredients, he explained. "You also can't pay people a living wage and benefits as we do and crank everything out as cheap as possible." He explained provincial taxes and packaging alone cost brewers the most when it comes to the basic production costs that go into producing and distributing a short can of beer. And with the effects of U.S. President Donald Trump's 10 per cent tariff beginning to reveal their effect on Canadian beer producers, beer costs are expected to go up as aluminium cans become more expensive, he said. "In our view there's just not a way to do it right for a dollar." Dominion City Brewing isn't alone. Ontario brewers including Great Lakes Brewing, Muskoka Brewery, Sawdust City, Blood Brothers Brewing, Descendants Beer, and Nickel Brook Brewing are opting to sit out on the premier's buck-a-beer challenge. Finance Minister Vic Fedeli spoke during question period in the Ontario legislature Wednesday, praising the government's voluntary buck-a-beer challenge as a "promise made, promise kept." Fedeli emphasized it would be up to brewers to choose to participate in the challenge or not, emphasizing that the program will offer no financial subsidies. "By encouraging competition in Ontario's brewing industry, opportunities will be created for value-priced beer products," he said, promising the policy is one that will put "more money in the pockets of consumers." Seated next to him, the Ontario premier pointed across the aisle to an opposition MPP and said the buck-a-beer program is "gonna save you a ton of money, buddy." Ontario Premier Doug Ford and Finance Minister Vic Fedeli stack beer with Barley Days employee Kyle Baldwin before announcing the buck-a-beer plan at Barley Days brewery in Picton, Ont. on Aug. 7, 2018. "We're doing this smartly, and responsibly," Fedeli said, hinting at concerns about alcohol abuse. "We're going to trust consumers to make mature and responsible decisions. But there is zero tolerance for those who do not." Government House Leader Todd Smith later rose to speak about the previous day's "very good news announcement" that took place in a Picton, Ont. brewery in his riding. 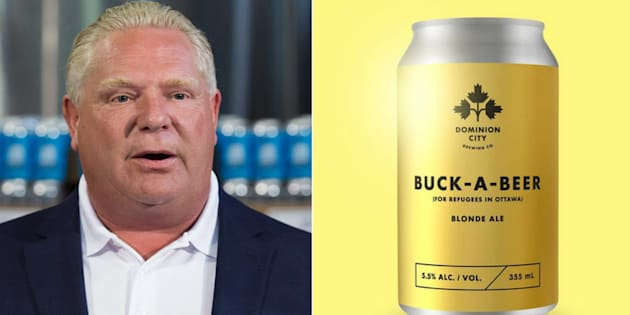 He repeated the government is fulfilling a campaign promise to bring buck-a-beer back to Ontario. "I'm really happy to say we're lowering the cost of hydro, we're lowering the cost of gas, we're lowering the cost of beer," Smith said to supportive cheers from the Tory bench. But McJannett thinks the Ford government's buck-a-beer policy "fundamentally misunderstands" that consumer values now are different from what they were 10 years ago. "As much as they would love to pay $24 for a two-four, I think they would choose, every time, supporting people doing something positive in their community."